Home News & Events Blog Welcome to Cybersecurity Awareness Month! The phrase, “humans are the weakest link in security” is one we’ve all heard by now. It’s proving to be very much the case as hackers are increasingly targeting humans instead of their network perimeter. Many recent security incidents have been either triggered by a spear phishing attack or social engineering activity in which the end user was talked into sharing their personal and/or confidential information. Awareness is the first key step of any successful cybersecurity program by helping mitigate the risk of breaches and security policy violations. Governments have also realized the importance of cybersecurity. Every October, Public Safety Canada runs cybersecurity awareness campaigns that have been internationally recognized. 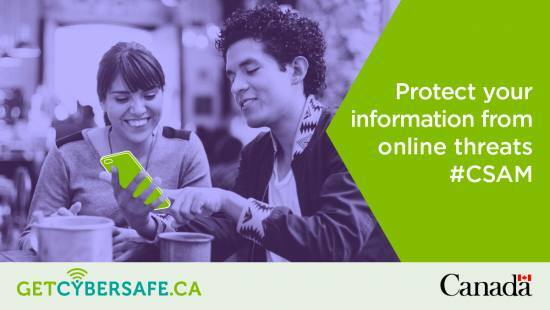 The campaign aims to help Canadians be more secure online through education about the simple steps to protect ourselves, our families, our workplaces, and our devices. As part of the shared CISO initiative at ORION, we have been working closely with the participating institutions on developing an integrated security awareness framework. As part of October’s Cyber Security Awareness month, ORION is promoting the importance of cybersecurity awareness in the research and education sectors. This month, many universities and colleges are conducting activities and compiling helpful resources for their staff, students, and faculty members to be more cyber secure. Here are a few highlights. I encourage you to either attend these events, get inspired to run your own, or reach out to find out more! They are also holding a poster competition for students to submit their posters on cybersecurity and compete in a quiz named “Big Wheel” in which players can test their knowledge on cybersecurity and compete for fun prizes. OCAD University set up an IT security page for students, faculty, and staff to access helpful resources on being more secure online. Posters designed for the page will be displayed to remind visitors to protect their devices, backup their data, and to never share personal information online for freebies. These institutions are carrying important initiatives to educate the members of their community to be smarter, safer, and more protected online. Join us as we learn more about the different aspects of cybersecurity this month!